It’s time to dust off that lederhosen you purchased on a whim from your Contiki Euro-trip 10 years ago. The masterminds behind Steam Whistle Brewing are recreating the authentic Oktoberfest experience at Vancouver’s Imperial Theatre on September 20, and we’re giving away two tickets to this gastronomic extravaganza. Check out our Twitter account (@TheSnipeNews) for contest details! The evening will feature Steam Whistle’s famous pilsner served in a limited edition stein (free with every ticket), as well as a spread of artisanal sausages from the fine folks at Bestie. Partygoers can dance off the beer and meat sweats to the traditional Blasmusik of the Rheinlander Oom-pah Band and be immediately transported to the heart of Munich, where the Bavarian fete originated. Already made plans on that evening? You can still get into the Oktoberfest spirit by visiting select local pubs from September 20 to October and purchasing a half-litre Steam Whistle stein as a keepsake. Oktoberfest has been a beloved celebration for centuries, inviting millions of tourists to break bread, or rather pretzels, and raise their glasses in harmony. We are thrilled that Steam Whistle and its collaborators are bringing this celebration back to Vancouver for the second year in a row. Gather your friends and join the crew at the Imperial on Saturday, September 20 at 8pm. Tickets are $15 in advance or $20 at the door. 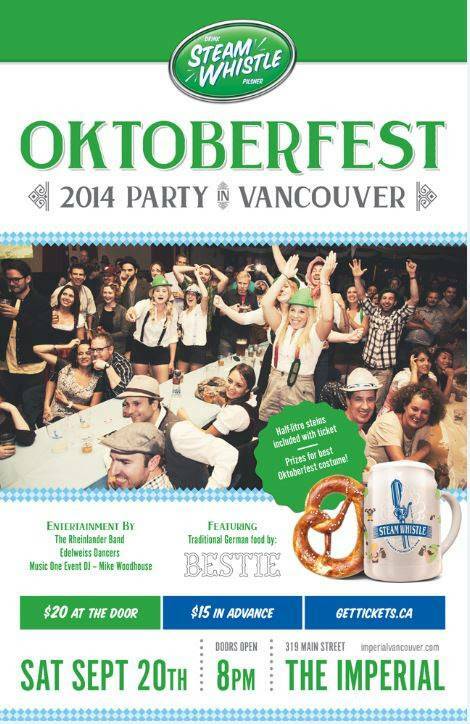 This entry was posted in Contests, Features and tagged Oktoberfest, ticket giveaways, Vancouver contests. Bookmark the permalink.